Ahh... Matcha! Although I can't remember when I first had a taste of matcha, I can proudly say that I've been a fan of this Japanese green tea powder for quite a while now. Matcha latte, matcha ice cream, matcha panna cotta, or anything matcha in general -- I have a strong penchant for ordering. But today, I'm not here to just gloat about another matcha dessert. How about we learn how to actually make a Matcha Green Tea Cheesecake? And from the Modern Dessert Prince, Chef Edward Mateo of Royal Patisserie, nonetheless. 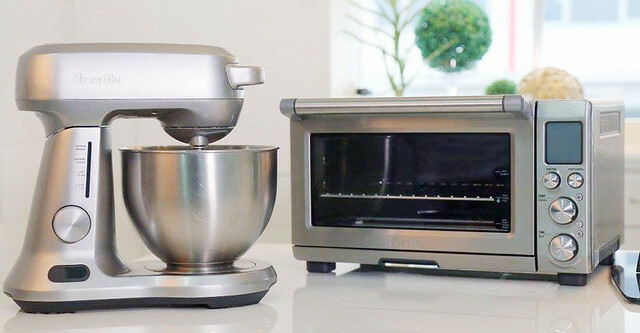 Preheat the Breville Smart Oven™ at 150C. In a separate bowl, mix all ingredients for the crust until well-combined. Press the crumb mixture over the bottom of a 8-inch springform pan wrapped in foil. Using the Breville Scraper Mixer Pro™ and the Scraper Beater attachment, cream the cream cheese and matcha green tea powder until smooth. Add only half of the cream and mix until smooth. Then, add the other half and mix again until you have a smooth, creamy mixture. With the mixer on light mixing speed, beat in the eggs one at a time. Wait until the previous egg is just barely mixed into the batter before adding the next one. Mix in the sugar and flour for about 1 minute until incorporated. Pour the mixture over the pan and spread it into an even layer against the sides of the pan. Bake using bain marie method for about 1 hr and 30 minutes. Once baked, cool for 2-3 hours, and add decorations as desired. Enjoy! So give it a try if you're also a fellow matcha lover! Let's satisfy our matcha cravings with Chef Edward Mateo's help and Breville! Get ready for BIG SAVINGS at S&R!! !